Can we better protect ourselves from mudslides? The mudslides in Santa Barbara County have been exacerbated by the recent wildfires. But people are now asking, should we build in these mudslide-prone areas? Of course, it’s hard to have this discussion when people are dying and their property is being destroyed. And yet, as we continue to push the frontier of development into nature, we run into more lives and homes being lost to fires, floods and mudslides. This has been the story of California since it's been developed -- the price we pay for living in paradise. It is a glorious but unstable landscape. There are many thinkers and designers who call for living in greater symbiosis with the landscape but it’s a hard conversation to have in the moment of crisis. Then the crisis passes, the sun comes out and we move on. 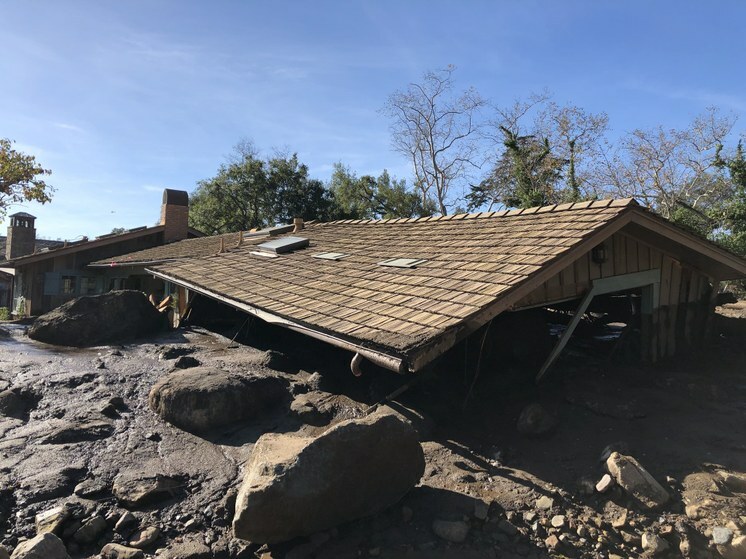 Architect Greg Kochanowski, a principal with Rios Clementi Hale Studios, has been thinking about how to design in a way that absorbs the power and the debris of mudslides, rather then simply building a wall against them. His team looked at a series of debris basins that sit at the base of the San Gabriel Mountains, which are nearing the end of their 50 year lifespan and require regular maintenance. What the teams came up with is an alternative to these large debris basins that sit at the bottom of mountains now. Instead they propose micro debris basins placed at many points up the slope of the mountain that would allow debris to accumulate but let water pass through -- kind of large sieves -- and slow the speed of flowing mud. “As things come down the hill they pick up more debris and speed up and really create that devastating impact. If there is a way to capture that or slow that much further up the hill, you can reduce that overall velocity and volume and then mitigate the amount of damage that would happen down below. So the thought is to truly capture before it it can come up to these kind of breakneck speeds," Kochanowski said. The project proposes little V-shaped gradients that capture debris as it comes down the slope. "What we're looking to do is create a kind of resilient infrastructure, one that performs the way that it should to defend property and people, but also allows for a kind of rebuilding or reconstituting of the mountainside so that habitat can resurge much more quickly after a fire,” he said. He says that longterm we need to consider a resilient symbiotic posture rather than a “defensive posture.” By defensive he’s referring to our tendency to put up walls, but eventually those walls fail. It’s not just homes, either. Coastal freeways like the 1 and 101 were bound to be wiped out in mudslides. Should we rethink how we build our roads and freeways? Kochanowski says we need to soften the edges of our roads and highways. Right now for example you’ll see Jersey barriers or K rails -- those portable concrete barriers that are like upside down Ts -- put up to divert water and mud from people’s properties. These turn streets into chutes of mud and water. He says instead we should be adding swales along perimeters of sidewalks or streets that can capture rainwater and mud and serve as a natural interface between traffic and hillside. A swale is a kind of ditch with planting in it that filters water back to aquifers and stabilizes the soil. You can see them more and more at the perimeters of parking lots. - Get mudslide insurance, which is not usually covered by standard policies. - Install flexible pipe fittings, which can better resist breakage, to avoid gas and water leaks. 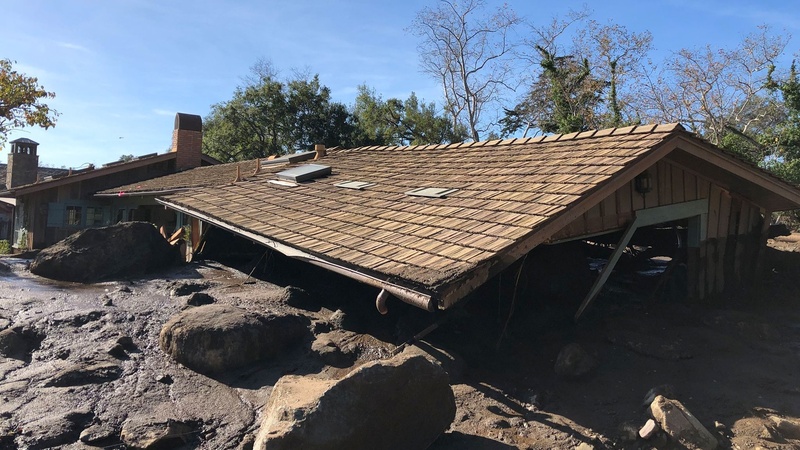 Mudflow, boulders, and debris from heavy rain runoff early Tuesday reached the roof of a single story home off San Ysidro Creek in Montecito. Photo credit: Mike Eliason/Santa Barbara County Fire Department.